According to legend, the Yellow Emperor founded the Chinese civilization in 2697 B.C. He is said to have stabilized China: It was he who united tribes and changed society from one that relied on hunting to one that grew crops, and his reign glittered with prolific inventions. Essential knowledge for the civilization of humanity became known during this time, such as music, medicine, arithmetic, the written word, and the making of boats, silk, and clothes. He is said to have achieved spiritual enlightenment during his life. According to the legend, when he was ready, heaven opened for him, and a yellow dragon came down. 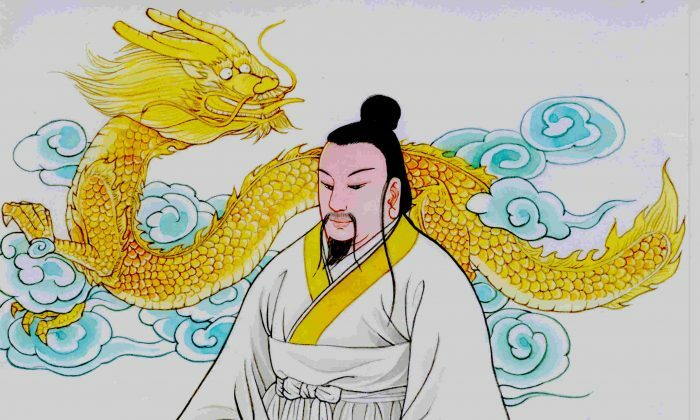 He is said to have flown skyward on that yellow dragon, taking with him more than 70 officials who also achieved enlightenment, and leaving behind an enriched civilization and 10,000 witnesses of the spectacular flight. Two other great influencers of Chinese culture, Lao Zi and Confucius, were born about 2,500 years later. Both were born in the long Zhou Dynasty during its decline. Lao Zi instructed people to return to their original, pure nature and left for people “The Classic of Dao and Virtue,” commonly known as the “Dao De Jing.” Confucius taught benevolence, and that through benevolence people can achieve the Dao. In A.D. 67, the teachings of Buddha Sakyamuni, originating in India, swept through China, advocating self-salvation and meditation, further enriching the spiritual thought and culture of China. Approximately 5,000 years after the reign of the Yellow Emperor, in 2006, a group of artists formed a performing arts company in New York, which they named Shen Yun Performing Arts. Their vision was to restore and disseminate traditional Chinese culture, retaining its depth and essence, and conveying its wisdom to people in the world today. The company’s website says: “Since ancient times, China has been known as the ‘Celestial Empire.’ This refers not only to China’s strength and position as East Asia’s Middle Kingdom, it also captures a more profound meaning, describing a land where the divine and mortal once coexisted. The types of experiences that many people talk about after watching Shen Yun productions indicate that the wisdom of the Land of the Divine, home to Confucius, Lao Zi, and countless sages, is reaching the audience. Shen Yun Performing Arts transmits these meanings to modern audiences through the Shen Yun performers. All performers, from Shen Yun’s orchestral musicians, to solo virtuosos, to classical Chinese dancers, to the conductor and stage technicians, work together to uplift the audience with the essence of Chinese culture. Confucius said, “Wherever you go, go with all your heart.” Shen Yun performers, exemplifying this saying, are focused and disciplined. Each year Shen Yun’s 80-member touring companies (six of them for the 2019 season) travel the world, imparting the brightest wisdom that emerged from a culture made over the course of many dynasties. Like many monks and sages throughout Chinese history, Shen Yun performers meditate daily together, and apply self-discipline not only to their bodies but also to their hearts and minds. Performing in theaters all over the world and at many sold-out shows, Shen Yun continues to expand its tours. The company is now in its 13th season, has added new cities to this year’s itinerary, and has increased the number of performances in several major cities. There are billions of people in the world, but the word is getting around: Shen Yun Performing Arts not only performs divine culture—it radiates it.